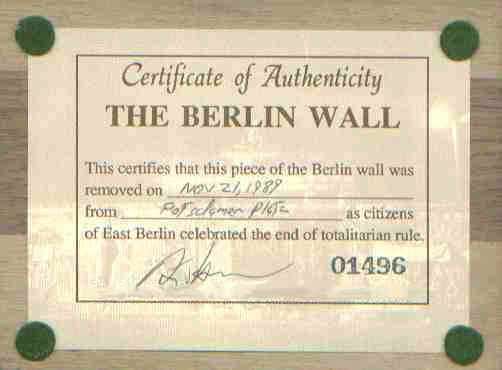 The Berlin Wall Makes an Excellent Gift! Prints and high-resolution scans of photos in the photo gallery are available for purchase. 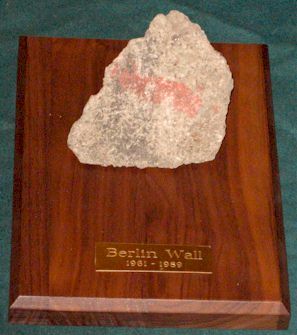 Celebrate the victory of freedom over Communist tyranny with a genuine piece of Berlin Wall, mounted on a walnut plaque with a brass nameplate and a numbered certificate of authenticity. 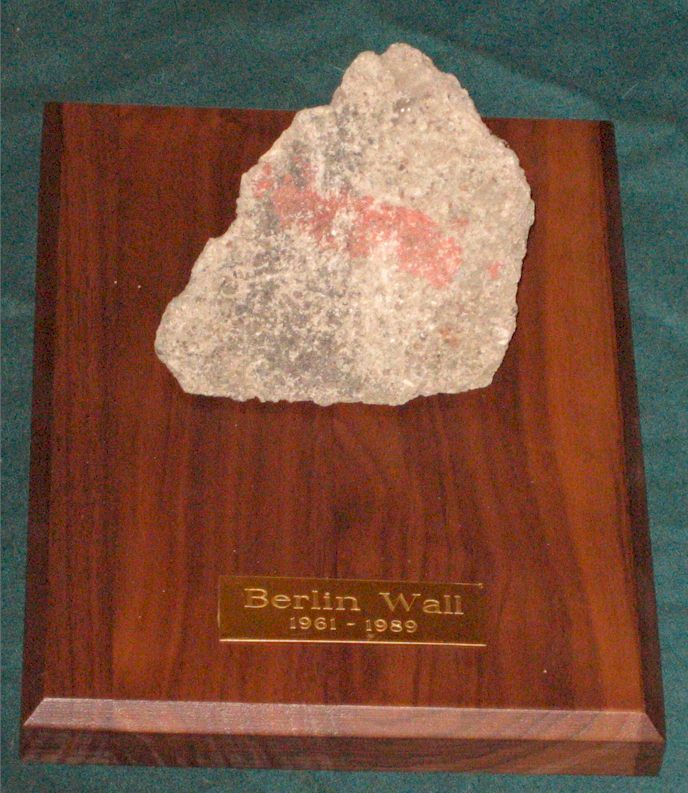 Give a gift which will be treasured for life--Berlin Wall makes a great gift for any occasion including Christmas, anniversaries, birthdays and corporate recognition, or for that special 'thank you'! Businesses will find this a truly special gift for clients and suppliers as well as for exhibit on desks and in reception rooms. The Wall makes an excellent achievement award, recognition item, corporate gift, presentation prize, etc. Reward the person who "broke down barriers." Custom mounting or specially inscribed nameplates are available. 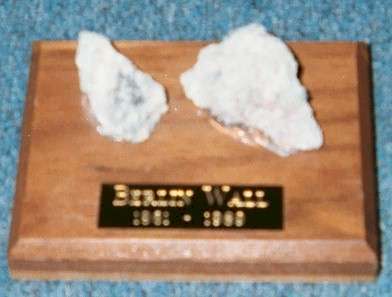 For a special presentation, the founder of this website is available to speak to your group about his experiences at the Berlin Wall, and how they relate to your industry, event or award. Mounted on a 5" by 3-3/4" walnut base. Wall pieces vary in size and shape--no two pieces are the same! Some are from the face of the wall, with or without paint, others from the interior. Single or double pieces. $85.00 + $5.00 shipping in USA. Contact for shipping costs to other countries. $275.00 and up depending on size and appearance, plus shipping. 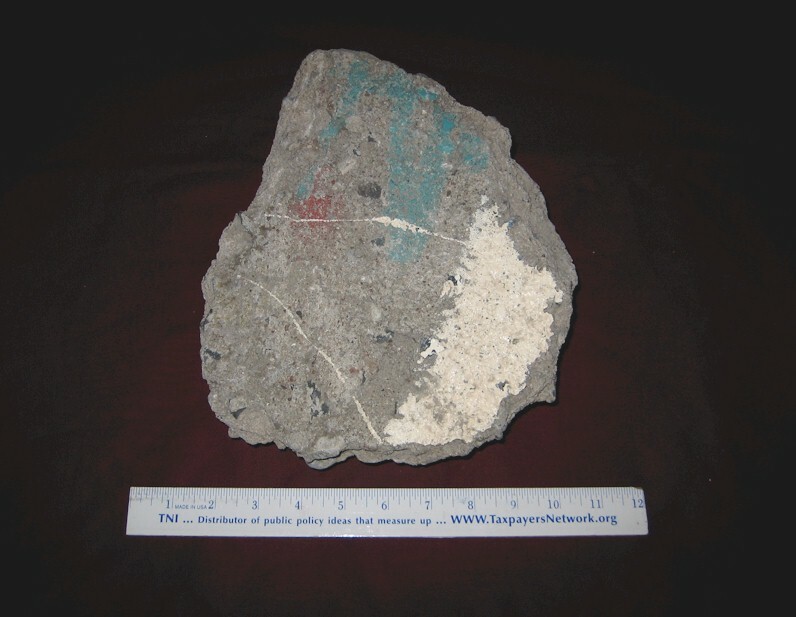 These pieces of the Berlin Wall were taken from the wall on Leipziger Strasse at Potsdamer Platz, about halfway between the Brandenburg Gate and "Checkpoint Charlie" (Friedrichstrasse). Potsdamer Platz was one of the busiest areas in pre-War Berlin. The famous graffiti on some of these pieces said in large lettering: "Love is thicker than concrete"
The Berlin Wall is a remarkable piece of history that symbolizes not only the era of Soviet tyranny but also the extraordinary, bloodless collapse of Communism which brought freedom to millions. 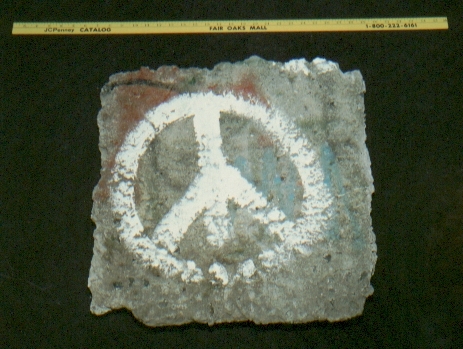 You will find people inspect and touch pieces of the Wall in the same way people admire and touch moon rock at museums--it's very emotional for some people. 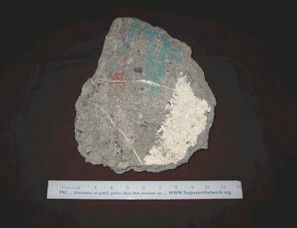 Of all the artwork in history, none conveys a message as powerfully or as simply as does a piece of the Berlin Wall. The remaining Wall was crushed and used in rebuilding the city, and there may be no other pieces of the wall of this size and importance which have survived outside of museums. I invite you to consider this remarkable artifact for your collection or display. The price is U.S. $19,000.